Tag line: "Loneliness is much better when you have got someone to share it with"
Though simplistic in nature, The Station Agent is an utterly charming movie, one that doesn't strive to amaze its audience, yet goes to great lengths to entertain them. Fin McBride (Peter Dinklage), a train enthusiast from Hoboken who also happens to be a Little Person (afflicted with Dwarfism), has just inherited an abandoned train depot, which is situated in the remote town of Newfoundland, New Jersey. Being a man who enjoys his privacy, it seems like the perfect situation for Fin, but his hopes for a little peace and quiet are dashed when he learns he isn't the only one in town. First, he meets Joe (Bobby Cannavale), a chatty coffee-truck proprietor who peddles his wares in front of Fin’s depot. Joe is outgoing, almost belligerently so, and is bound and determined to become Fin’s friend, whether Fin likes it or not. Then there's Olivia (Patricia Clarkson), who recently separated from her husband following the tragic death of their only child. While Olivia is more down-to-earth than Joe, she can also be a bit flighty, occasionally driving Fin to the point of distraction. Fin’s dreams of living a quiet, lonely life may have been shattered, but soon discovers there's a place for him after all in this remote little corner of the world. The performances of the three leads are pitch perfect. Peter Dinklage's Fin lets it be known he prefers his privacy. Mind you, he's never mean-spirited about it, yet at the same time, he's uncomfortable when it comes to dealing with others, and does his best to avoid them at all costs. Dinklage gives a flawlessly understated performance, but The Station Agent’s most powerful turn is delivered by Patricia Clarkson, portraying a mother still suffering from the heartbreaking loss of her son (he died after a fall in the playground) and husband (whom she threw out because the two of them were no longer communicating). Clarkson’s Olivia is a lot like Fin in that she wants to be left alone, but also seems to naturally gravitate towards these two new men in her life, ultimately accepting their friendship with open arms. The Station Agent offers little along the lines of traditional excitement, and doesn’t put its characters through any sort of deep, psychological transformations. No, the true magic of The Station Agent lies in the relationship that develops between its three main characters. 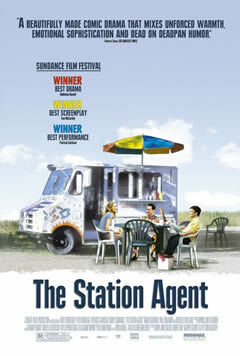 Give The Station Agent a chance; you’ll be amazed how entertaining a film about a trio of people and a train depot can be.